Science Fiction Darkside - ZineWiki - the history and culture of zines, independent media and the small press. 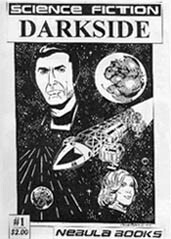 Science Fiction Darkside is a media science fiction fanzine by David Owens. Published in London, Ontario, Canada, in the 2000s, the aim of the fanzine in the editor's words was to "focus exclusively on sci-fi TV shows and movies that explore the darkside of space fantasy and adventure". Science Fiction Darkside features articles, essays, fan fiction, art, comics, and letters to the editor. Early issues were dedicated to the television series Space: 1999. The first issue appeared in December 2001, with issue 2 following in June 2002, Issue 3 was published October 2002, and issue 4 in June 2003. Contributors of articles included a regular column by Jonathan Gilbert, and editorials and articles by David Owens. Contributors of fiction included Joel Owens, and Ken Scott. Comics were by Jonathan Gilbert with Seppo Makinen, and Yul Tolbert (Timeliketoons). Artwork was by David Owens, and Yul Tolbert. This page was last modified on 6 March 2012, at 09:54.